The R-PLEX Human TNF-RI Antibody Set includes a matched capture and detection antibody pair and calibrator for the quick and easy measurement of TNF-RI in biological samples. R-PLEX products leverage MSD’s electrochemiluminescence technology for better sensitivity and a larger dynamic range than traditional ELISAs. R-PLEX matched antibody sets enable the development of singleplex and multiplex immunoassays. Individual assays may be developed using MSD avidin- or streptavidin-coated plates. Custom multiplex assays with any combination of R-PLEX analytes, as well as R-PLEX plus U-PLEX analytes can be developed on U-PLEX MULTI-SPOT plates. To learn more about the advantages of R-PLEX products click here. 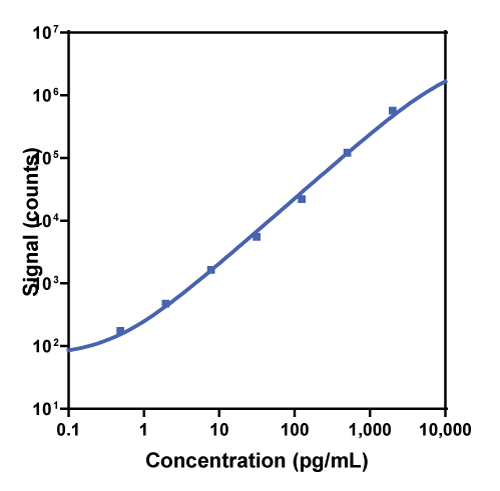 Calibration curve for the R-PLEX Human TNF-RI Antibody Set was assessed and representative data is presented below. Description - Tumor Necrosis Factor-Receptor 1 (TNF-RI, FPF, p55, p60, TBP1, TNF-R, TNFAR, TNFR1, p55-R, CD120a, TNFR55, TNFR60, TNF-R55, TNFRSF1A) is one of two receptors for TNF-α, a pleiotropic cytokine involved in the acute phase inflammatory response. The biological actions of TNF-α are mediated through these two receptors, TNF-RI and TNF-RII. TNF-RI is constitutively expressed in most tissue and can be fully activated by both the membrane bound and soluble forms of TNF-α. TNF-RI has been associated with autoimmune conditions including rheumatoid arthritis and myasthenia gravis. Mutations in the gene for TNF-RI have been related to a genetic condition called tumor necrosis factor associated periodic syndrome (TRAPS) or periodic fever syndrome.